Tonight will see a huge game in the English Premier League, when Arsenal will meet Everton in the Emirates Stadium in London. The game will be Live on Sky Sports tonight at 19:45 UK time. Arsenal and Everton are in an extremely close battle for a place in the lucrative Champions League next season. Arsenal have started an extremely timely surge in form with 7 wins out of their last 8 games and 4 consecutive victories, to take them above their local rivals Chelsea and Tottenham Hotspur. Everton are just 4 points behind the Gunners and have a record of games defeated that only Manchester United and Manchester City have beaten this season. Tonight’s Clash will certainly be a game worth watching Live on television but if you are interested in checking out some of the great Premiership Football Views of the impressive Emirates Stadium then take a look at the Camvista Premiership Stadium Views. Take a Virtual Tour around the amazing Arsenal home ground and check out some of the fantastic views of this impressive Football Stadium. Take a virtual tour around the ground and the surrounding areas and check out all the great locations for supporters to soak up the electric atmosphere of an English Premiership Game. 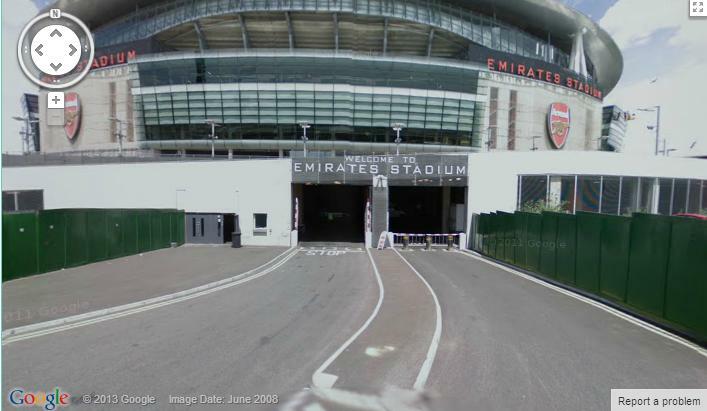 This is a great view of the entrance to the stadium for both the away team bus and the Arsenal team bus. The road takes the buses directly underneath the stadium to the players changing rooms. A great Aerial View overlooking the fantastic Emirates Football Stadium in London, England, ahead of tonight’s huge English Premiership game between Arsenal and Everton Live on Sky Sports! Camvista have some fantastic Street Views and Aerial Map Views to offer from all over the World. 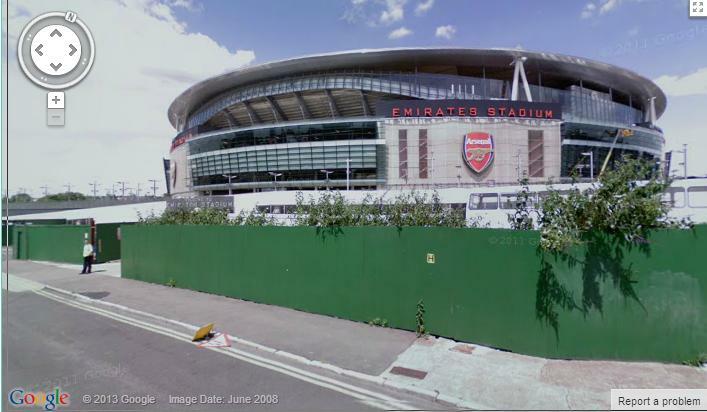 With Street Views from all over London the Emirates Football Stadium is just one of a great collection of London Street Views and London Aerial Map Views on offer. If Arsenals Emirates Stadium is not your favorite ground then check out all the English Premiership Football Stadiums with the Camvista English Premiership Stadiums Virtual Tours. Check out all the great Aerial Map Views and Street Views now with the Camvista World Cams Section.